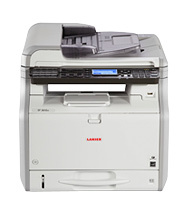 The compact Lanier SP 3610SF monochrome MFP provides innovative LED print technology that raises print quality and lowers cost per page, while supporting the habits of your mobile workers. If you think mobile printing has to be complicated, think again. The LANIER SP 3610SF allows your workers to print and share images, documents and photographs using the RICOH Smart Device Print&Scan app from their iPhones, iPads or Android smart phones or tablets — without the hassle of print drivers. With standard duplex printing, you can use less paper. Double down again with the printer's EPEAT® Silver rating (EPEAT is a global environmental rating system for electronic products) and ENERGY STAR® certification. And, you can easily recycle toner cartridges and containers.